Lt. Bradley Snyder, swimming his preliminary 400-meter freestyle heat at the 2012 U.S. Paralympics Swimming Trials in Bismarck, N.D., is about to be "tapped" by his brother, Mitchell. 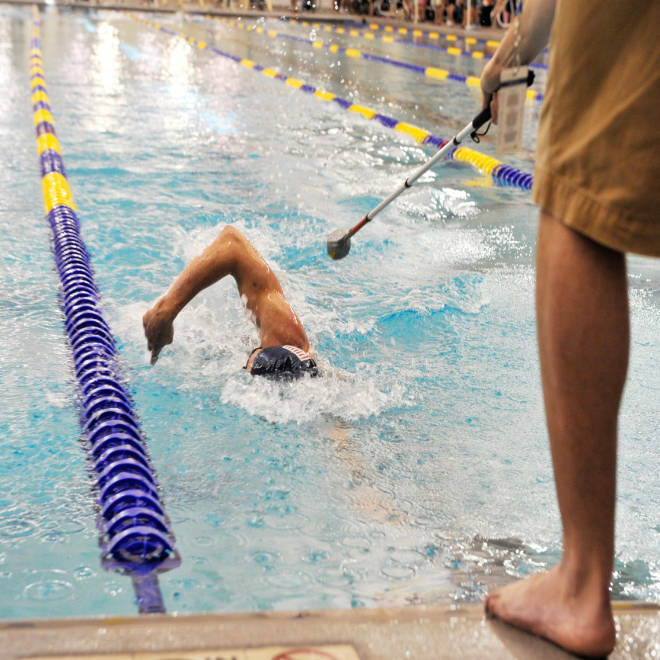 Even in the water, amid a furious race to win back his confidence, the blind swimmer needs a cane. Actually, Lt. Brad Snyder relies on two canes to avoid the sort of ugly collisions he has suffered repeatedly on dry land. At one end of the pool, his swimming coach stands above Snyder’s starting block, clutching a walking cane affixed with a tennis ball. As Snyder nears that hard edge, his coach leans down, extends the cane and taps the Navy officer on the back of his head with the ball, alerting him to abruptly finish his stroke and execute a flip turn. At the opposite end of the lane, Snyder’s brother, Mitchell, is armed with the same device and the same task. The tap is merely one of the tactics and tools that Brad Snyder -- blinded last September by an Afghan bomb blast -- now uses to swim competitively in utter darkness. During each length of every race, he silently tracks his stroke count to hold a steady clip. He occasionally brushes a finger or shoulder, lightly, against the lane marker to verify his location. And, oddly, he must wear blacked-out goggles, by rule, over both of his blue prosthetic eyes. Through Saturday, the former Naval Academy swimmer is vying for one of 14 roster spots at the U.S. Paralympic Swimming Trials in Bismarck, N.D. If Snyder, 28, equals or nears a current world-best time in one of his five events, he’ll join the American team bound for the 2012 London Paralympics, held later this summer. Wearing one of his old college caps with the Navy emblem on one side and the American flag on the other, he’s racing to again represent his country, this time on the international sports stage. He’s racing to help restore his self-image as a fully capable man -- a sacred piece of himself he lost when the IED detonated in his face. He’s racing to deliver a deeper message about thriving amid life’s occasional rough waters. Editor's note: This is the second installment that chronicles Lt. Brad Snyder's efforts to earn a spot on Team USA's roster for the 2012 London Paralympics. Read the first story here. That platform, he understands, will become far larger if he makes the 2012 U.S. Paralympic team. But getting to London is all about minutes, seconds and tenths of seconds -- the fewer of those during his heats, the better. And as a swimmer without sight, ensuring a brisk time is all about maintaining tight direction: the straighter he goes, the quicker he touches the finish line. But, much like his delicate job in Afghanistan and Iraq -- dissecting and dismantling homemade explosives -- haste in the pool can be Snyder’s enemy. When he swam for Navy in the early 2000s, Snyder’s initial style was to dive in and sprint -- no other strategy, no clean technique, just winning on pure guts. Eventually at the Naval Academy, he began to hone his strokes, evening his pace and becoming more efficient. Now, he and Loeffler are focused on keeping each 50-meter race length (or “split,” in pool jargon), as even as possible to all other trips up and down the pool -- both in terms of his times and his stroke counts. That physical symmetry allows Snyder to better hold his course and avoid side-swiping the lane markers. Snyder’s best shot at making the American team, he believes, will come in the 400-meter freestyle. At the Bismarck trials, he’ll also aim to notch qualifying times in the 50-meter and 100-meter freestyle heats as well as the 100-meter butterfly and 200-meter individual medley. For each heat, he’ll don special goggles – not, however, to boost his pace. Swimmers competing in the Paralympics’ fully blind division must wear the black, plastic eye covers to ensure that they can’t see even a glimmer of light. That would give those swimmers an advantage in a sport that takes itself as seriously as any Olympic endeavor. But behind those artificial eyes, Snyder has begun to visualize a blissful finish – especially if he makes the U.S. team. The final men’s Paralympic swimming roster will be announced on Sunday. “I really hope to bring attention to the wounded warriors (fellow servicemen and servicewomen hurt in Afghanistan and Iraq). And I hope my story maybe gives people some perspective,” Snyder said. If Snyder earns a Paralympic slot, his best race – the 400-meter freestyle – is scheduled in London for Sept. 7. That means exactly one year to the day that the U.S. sailor lost his sight after stepping on a battlefield bomb, he’ll be wearing American colors, swimming for gold. 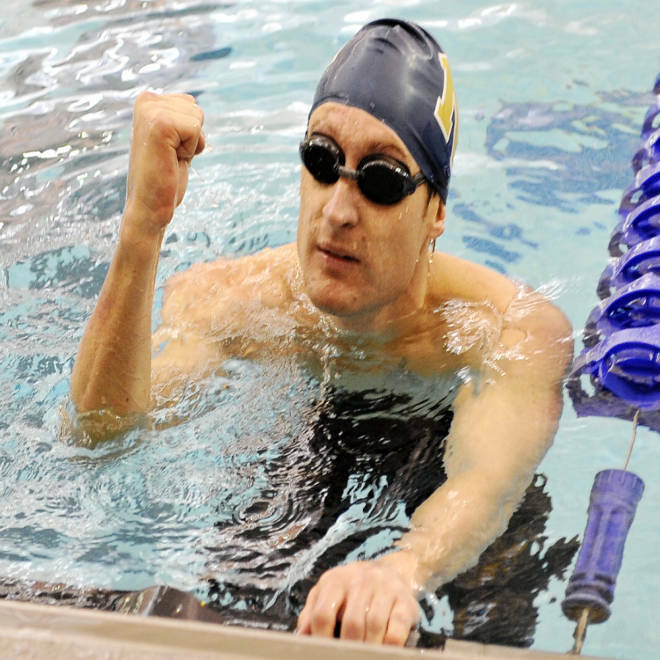 COMING MONDAY: Did Lt. Brad Snyder make the U.S. men’s Paralympic swimming team?